Elation also had a couple of very powerful IP rated fixtures as well as a couple of console surprises. 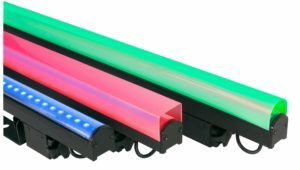 First up, the PIXEL Bar LED IP, which comes in three varieties—30 IP (.5 meters), 60 IP (1 meter), and 120 IP (2 meters) with a rating of 65. Each fixture has the noted number of LEDs, a 120-degree beam angle, and an outstanding refresh rate of 44,000Hz for flicker-free operation. Each fixture can be connected together with the built-in magnetic end caps and have an adjustable mounting bracket, square and round frost attachments and a safety cable loop. These fixtures are able to communicate over Kling-Net, ArtNet, and sACN. The units receive power and data through rated IP 4pin cables and can be purchased in varying lengths between 2 and 50 meters. Control for these bars is through the Pixel Driver 4000, which allows for simple onboard control and full pixel mapping. The Pixel Driver has 4 outputs and also allows for multiple control units to be linked together through RJ45. The unit allows for a maximum of 4,080-pixel mapping through Kling-Net or 680 max through Art-Net and sACN. The Artiste Van Gogh is a 16,000 lumen 380W LED wash fixture with a 16bit CMY color mixing plus CTO and a dedicated UV filter. Unlike most wash fixtures, this fixture includes a 4 blade internal barn door and an optional Fresnel lens which increases the zoom range from 7-55 degrees to 11-66 degrees. 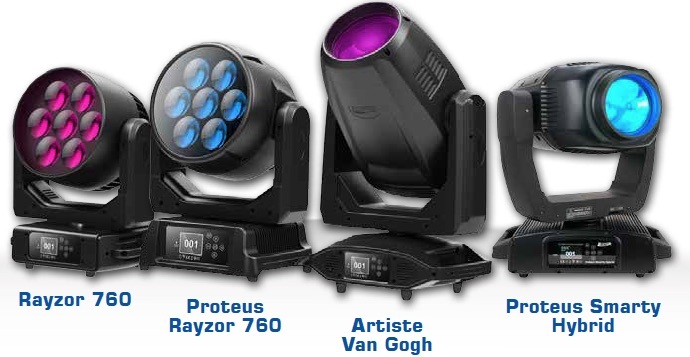 The Artiste Monet is at the top of the class with a 950w 6,000K LED engine, emitting a powerful 45,000 lumens. This fixture contains not only CMY, and CTO, but also has RGB flags for even more intense color mixing. One of the more interesting features is the High CRI Filter that boosts the CRI from 70 to 82. Some of the Monet’s other features include 360-degree framing shutters, 7 rotating and 7 fixed glass gobos, animation wheel, 4 facet and linear prisms (rotating), Light and heavy frost, motorized iris, and zoom from 6 to 50 degrees. Another exciting new fixture from Elation is the Rayzor 760 wash effects unit. This fixture features the new patent-pending technology called TwinkLED—28 white LEDs placed in the lens of the fixture to allow for visual eye candy. The Rayzor has 7 60W LEDs for 8,000 lumens of output and a zoom range of 5 to 77 degrees. This RGBW fixture also has CT presets from 2700k to 8000k, with 16bit dimming. Finally, the Smarty Hybrid boasts all the qualities of a moving light—wash, spot, and beam. With a lumen output of 11,000, this fixture takes it to the next level. The lamp for this fixture is a Philips MSD Platinum 200 Flex lamp with “FLEX” technology—a technology designed to use a discharge lamp and ballast package to “produce high output and compact performance”. In its various beam, spot, and wash modes it has a 1 to 18-degree zoom, a 3 to 27-degree zoom and a 5 to 33-degree zoom. Also included in this fixture is CMY color mixing, CTO, CTB, UV, and 13 dichroic colors including a quad-color filter. There are 8 fully rotating and interchangeable glass and 12 static gobos, as well as a 16 facet and 5 facet linear rotating prisms. Last but not least, this fixture also contains Elation’s own E-Fly internal WIFI transmitter for wireless capabilities. Recently purchased by Elation was the Martin M series consoles. These consoles have been rebranded under the name Obsidian. While some of the consoles still exist under the old name, there were two consoles that were presented under the new name: Onyx NX2 and Onyx NX Wing. 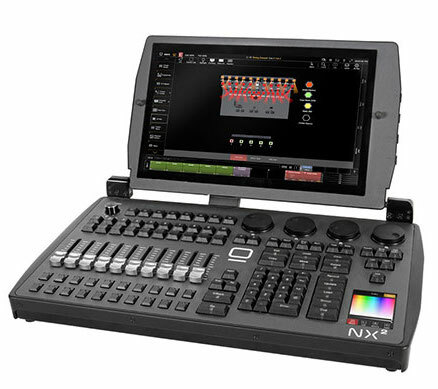 The Onyx NX2 console contains a full HD touchscreen, 8 encoders, full keypad and command buttons, with 4 assignable buttons, a single grandmaster and 10 full playbacks. This Windows 10 based system also contains 64 universes out of the box—without any external hardware needed. Other specifications include 2X External 4k touch displays, 4 DMX ports, MIDI, and 5 USB ports (1 @ 2.0). The Onyx NX2 Wing is the control surface for the ONYX platform. This allows you to run ONYX on any PC platform and control your rig over USB connection. This wing includes a fully unlocked license of 128 universes. Key features of this item are: 4 DMX ports, MIDI, 10 playbacks, 4 encoders, and keypad.